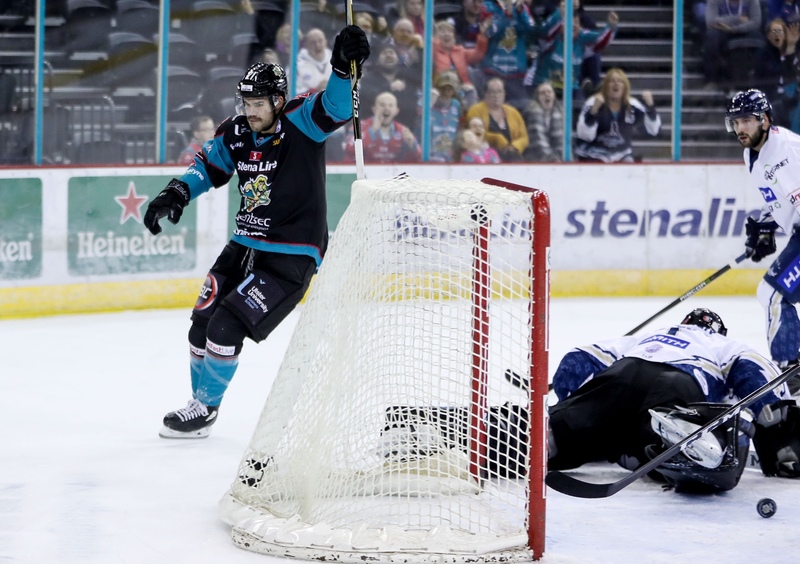 A pivotal weekend for the slumping Belfast Giants began on Friday night with the first of a home double header against league table neighbours the Milton Keynes Lightning. From the puck drop you could sense that the Giants, clad in their black alternate unis, felt the urgency to turn things around. The home side were strong from the outset, finishing checks and maintaining a high tempo- pinning the puck in the MK zone for the majority of the period. The first real chance for the Giants came in the third minute, with Francis Beavillier connecting well on a pass fed from the slot, which was tipped into the safety netting in the arena’s West end. Belfast continued the pressure, forcing several Lightning turnovers in their own zone, but never quite finding a way past MK goaltender Patrick Killen from a series of close range efforts. Indeed, it felt like Killen’s goal mouth had come equipped with its own force field throughout most of the first period, especially when MK Forward Tim Wallace sat for slashing at 6.36. The Giants PP unit cycled well in the zone, setting up Josh Roach for an almighty clapper from the slot which bounced awkwardly off the post and stopped almost dead on the line. The mean in Teal, in Black, were knocking on the door. Tyler Beskorowany’s first major test came in the form of a turnover in the Giants zone, a cross ice pass landing square on his badge. 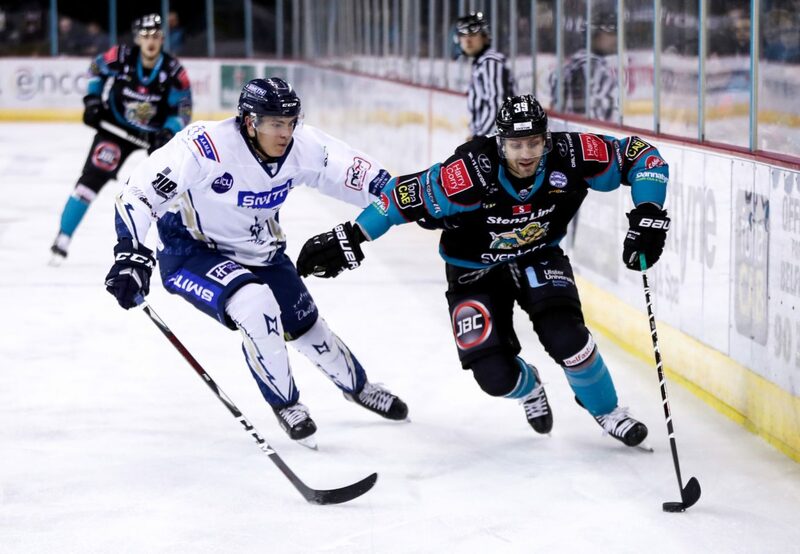 With a few minutes left in the first period, it was Francis Beavuvillier who finally hit twine for Belfast. Paul Swindlehurst’s rink-wide pass connecting with Blair Riley in the slot, his slight deflection finding the blade of Beauvillier, who promptly buried it past Patrick Killen with 3 minutes and change left in the period. 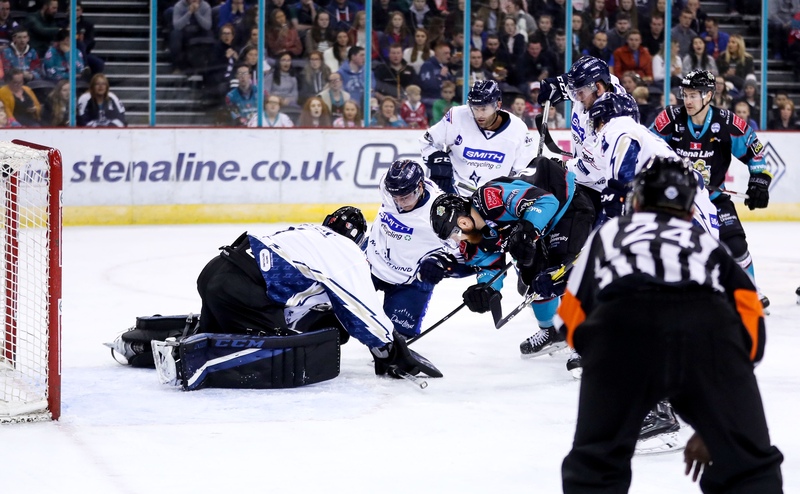 Milton Keynes were more offensively proficient and the Belfast Giants more scrappy as the second period got underway. Tyler Beskorowany, challenged almost off the draw, had to dig in as Blair Riley promptly sat for holding at 20.27. While the resulting penalty was killed without incident, the had started to look dangerous. Their breakthrough came midway through the period when George Golovkos found a loose puck in the Belfast zone with his back to Beskorowany, and with a tight spin fired off an almost no look wrister low which seemed to surprise the Giants goaltender (Bel 1-1 MKL). From here, the second period got scrappy with both sides trading chances. A scramble in front of the Giants goal led to Guillaume Gelinas and the Lightning’s Eric Neily dropping the gloves in an electric tilt. The much smaller Gelinas was physically outmatched and lacked the reach to get close to Neily, eating a number of punches and hanging on down low. However, what many in the arena thought was a loss was actually a display of grit. Gelinas, biding his time, finally saw his opportunity and rocketed inside with a huge uppercut- sending Neily to the ice. The embattled Giants fanbase erupted, showing their appreciation for a huge display of toughness from the Belfast Defenseman. The pair of fives were also came with a pair of twos- Mark Garside sitting for interference, and Eric Neily receiving an extra two for instigation at 27.12. The shot clock read 31-26 in Belfast’s favour as the third period got underway. The Giants had the most slender of leads, but initially the Gelinas fight had failed to ignite the team in the way the Teal Army had hoped. From there, the floodgates opened. Two consecutive MKL penalties led to a five on three Giants Power Play. Hunter Bishop promptly ripped a high slot clapper which rebounded out right to Patrick Dwyer, who simply had to flick the puck into an open back door (Bel 4-1 MKL). Still on the PP, Guillaume Gelinas was to make the iron sing shortly afterwards, his shot from the point tipped up onto the bar, before David Rutherford found himself behind goal- laying an inch perfect a backwards pass to Blair Riley who fired high into the goal from the left of the crease (Bel 5-1 MKL). With 8.51 left in the game, a fatigued Milton Keynes Lightning replaced Patrick Killen with Adam Goss in goal, and bar a frightening looking stick to the face to Colin Shields, which the referees missed, the Giants saw out the rest of the game without incident. A convincing third period securing the much needed points, overshadowed only by concern for the legendary Giants #19.